Phil Mickelson's mental game has been proven to be as solid as anyone on the game. In spite of all the critics and talking heads who over analyze the game from a "technical" perspective, Phil continues to stand up to the pressure and win. Phil just flat out knows how to win and seems to love the increased pressure moments like the Majors. Or when he's paired with Tiger Woods, like in the last round of the 2012 Pebble Beach Pro Am. At the Pebble Beach Pro Am he was paired with Tiger and was trailing Tiger by 2 to begin the day and was behind by 6 of the leader. He never made a single bogey on that golf course and out on a putting clinic. So what else did he do? Not much...He merely shoots a sizzling 64 and dusted the field, that's all! 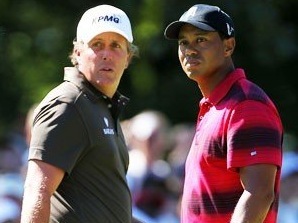 Phil blew by Tiger and left him in the rear view mirror and ended up winning the tournament by 2! No matter if you're a Phil Mickelson fan or not you have to admire his mental toughness and commitment to winning big time. The thing that most golfers or would be arm chair analysts don't notice is that Phil uses his mind in a much more "right brained" way. His toughness isn't stoic or stone faced. It is more of a playful, imaginative intensity, so to speak. He is focused on winning. Not how others perceive what mental toughness is or should be. Phil's mental game is filled with feelings of winning and from my perspective that's what a solid mental game is all about. Yes, he is a great player to model and learn from. Not only his amazing game and ridiculous short game but his inner game as well. You can have fun and be intense. This is the Phil Mickelson's mental game.